By Jessica Sattell (Fukuoka-ken, 2007-08) for JQ magazine. 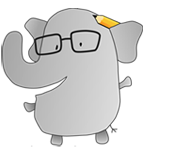 Jessica is a freelance writer and a graduate student in arts journalism. She readily admits that while she is an avid Hello Kitty fan, she is always going to like Chococat more. For many, young and old, female and male, Hello Kitty (or Kitty-chan, as her diehard fans lovingly call her) has been a lifelong friend. 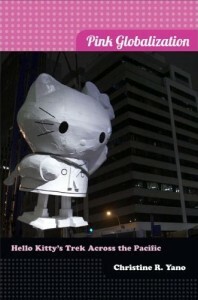 As I toted around my review copy of the new Pink Globalization: Hello Kitty’s Trek Across the Pacific—to my part-time job, to coffee shops, on a recent trip—strangers cooed over the cover’s soft pink color scheme and photograph of one of artist Tom Sachs’s renditions of the famous feline. Kitty led the way into my very first experiences with Japan, and her ever-presence has enriched my life in ways that I didn’t fully understand until diving in to Christine R. Yano’s research. The wide-eyed little cat has been Japan’s acting ambassador for decades, and her global travels had (and continue to have) profound impacts on generations of consumers and culture shapers. Pink Globalization is a culmination of over ten years of Yano’s fieldwork and research on the international ubiquity of Hello Kitty as an example of Japan’s actions as a tastemaker in global kawaii. Yano, who is Professor and Chair of Anthropology at the University of Hawai‘i at Manoa, explains that Kitty’s rise, development and continuing presence as perpetuated by both parent company Sanrio and an ever-growing fandom provides a rich text from which to examine a multitude of contemporary issues. Yano coins the term “pink globalization” here to refer to the spread of “cute” goods and images from Japan to other parts of the world, and it connects the actions of global capitalism with Japan’s “coolness” in its soft cultural products. Using Hello Kitty’s popularity as a fascinating case study, Yano explains the power of kawaii as a major signifier of the international zeitgeist; Kitty is inherently a cornerstone of Japanese popular culture, but she is now also ingrained in a much larger collective consciousness. In fact, as Yano describes, several of her non-Japanese interview subjects did not know at first glance that Hello Kitty was a Japanese character. One of the most fascinating findings from this dive into collector subcultures and obsessive fandom is that Hello Kitty is basically a blank canvas. That is, she seems to be a symbol without any deeper meaning onto which fans and detractors project. From the obvious visual point that Kitty lacks a mouth, we are encouraged to ascribe our own assumptions about her emotion (this stems from a theory that she is the latest incarnation of traditional Japanese aesthetics, which have historically downplayed or even removed mouths in figurative art to allow a greater narrative range). In being “blank,” she is a readily moldable resource for widely diverse sociocultural groups, and Yano explores here the many ways that Hello Kitty emerges as a cultural text appropriated for themes ranging a wide spectrum of innocence, violence, sexuality, feminism, consumerism and nationalism. In her symbolic fluidity, Hello Kitty is a “wink” on these themes and more, and she continues to pop up in unexpected (and often subversive) appropriations, such as an icon in the adult entertainment industry or as the darling of contemporary street fashion. While primarily an academic text, Pink Globalization is a very accessible discussion of Hello Kitty as an archetype, symbol, and phenomenon. Detailed, thoughtful and entertaining (and with some stunning images of her multitude of mainstream and niche appearances alike), this is a new look at how Japanese pop culture spreads, shifts, and changes in unexpected ways.